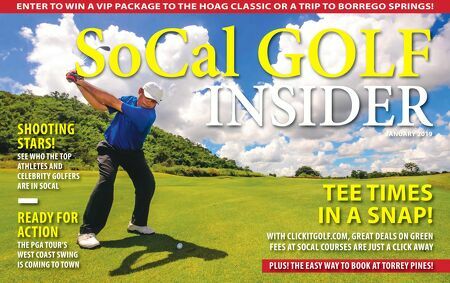 SoCal GOLF INSIDER JANUARY 2019 ENTER TO WIN A VIP PACKAGE TO THE HOAG CLASSIC OR A TRIP TO BORREGO SPRINGS! SHOOTING STARS! SEE WHO THE TOP ATHLETES AND CELEBRIT Y GOLFERS ARE IN SOCAL READY FOR ACTION THE PGA TOUR'S WEST COAST SWING IS COMING TO TOWN TEE TIMES IN A SNAP! WITH CLICKITGOLF.COM, GREAT DEALS ON GREEN FEES AT SOCAL COURSES ARE JUST A CLICK AWAY PLUS! THE EASY WAY TO BOOK AT TORREY PINES!